If you have ever asked why your mobile phone is getting slow although you haven’t installed many applications or huge games, or why your data is being consumed with a high rate while you are not using it unless to chat with your friends, you need to know more about the preinstalled apps and how to delete or disable them to get the best possible performance out of your phone. In this article, I will let you know how to delete Preinstalled Apps on Android , but first, you need to know the answer to the question; What are the preinstalled apps and why would you need to delete them? Why Do You Need to Delete Preinstalled Apps? Most of Android phone manufacturers apply their own interface on the system, along with a number of applications that are comes preinstalled, including the basic Apps like music players, internet explorer, cloud services like Samsung Cloud and others. These preinstalled applications cannot be removed nor deleted in the same way you delete your own applications that you download via Google Play Store. But, why would you think in removing these applications? Most of time, these applications do only the basic functions of its genre, and if compared to other applications they will lose due to what the other applications provide you. For instance, your Camera app could provide you with some features, but not like another camera application that provides you with many other functions like filters or others. And it’s the same for Phone applications that only offers a calling and answering functions, but doesn’t offer you caller ID via the internet or a way to block spammers. Also, these applications may include some services you don’t want to use but consume a huge amount of data which costs you a lot. For the previous reasons, I’m going to help you to know how to delete preinstalled apps on Android or disable it as it might need root permissions which we are not going to talk about much in today’s article, so follow the upcoming lines. The first thing and the basic thing you can do if you have an unrooted device or if you don’t want to root it is to disable Preinstalled Apps on your phone to stop them from working until you factory reset your phone or enable them again manually. First: Head to your phone’s Settings and go to Apps or Applications or Manage Applications. Second: Find the application you want to disable and click on its name. Third: In the head of the screen, you will find two choice, click on Disable to disable it until you enable it back later, or Force Stop to stop it from working temporarily. Another uncommon way to uninstall and remove pre-installed apps on Android without root is to use USB debugging, which allows you to give commands to your smartphone by using command prompt in your Windows running PC. First of all, you will have to enable the Developer Mode in your phone to be able to allow USB Debugging. First: Head to the Settings on your phone, and scroll down to the About Phone option. Second: Find Build Number and tap on it 4 to 7 times based on your phone’s manufacturer. After then, go back to the General Settings screen, and you will find Developer Options as the last section. Now you have enabled Developer Mode. You can now enable USB Debugging mode to allow your PC to run commands using USB cable. To allow USB Debugging mode, open Settings, go to Developer Options, find USB Debugging and enable it. Starting from this point, you will use your PC, first, connect your phone via USB cable to your PC, and once you have done that, you will find a new folder in the C drive called “ADB”. 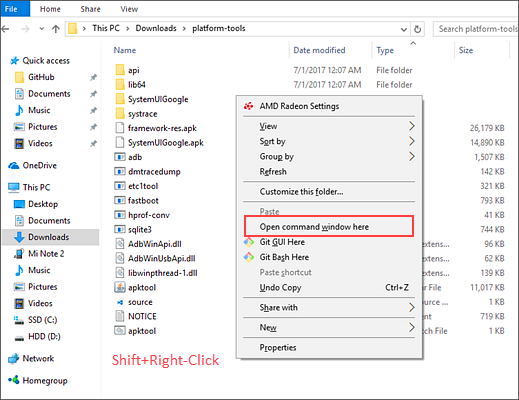 Open this folder, and right-click on any place on the windows holding Shift button, so you can find the “Open command window here” option. After clicking on Open command windows here, you will have the command windows where you can give commands to your phone. 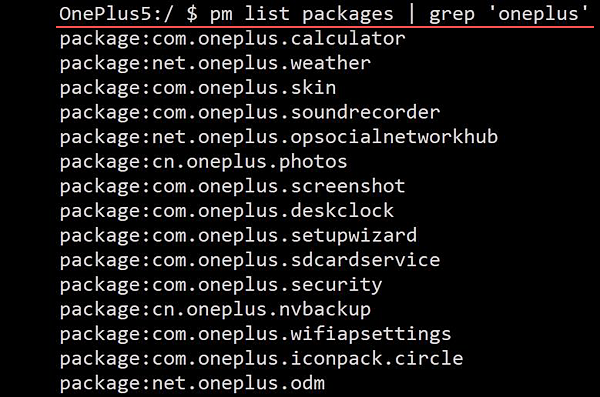 Note: Change the OEM, Carrier or the App Name to what you need, in our case, write the name of your phone’s manufacturer like Oneplus. Now you have uninstalled the Calculator application that’s preinstalled by Oneplus or whoever the manufacturer of your smartphone. 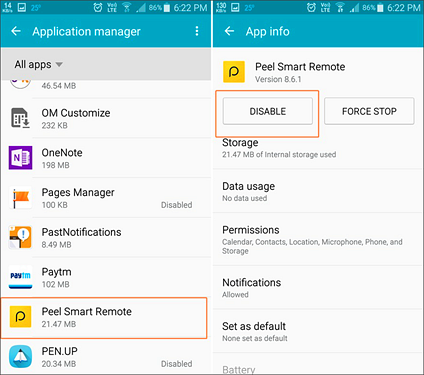 The last option you may select is rooting your device to have root permissions which allows you to modify your system and do many other things including removing Preinstalled Apps on Android. There are many ways to root your device, a method for each type of device and for each manufacture. After having your device rooted, you can download one of these Applications to uninstall and delete system Apps on Android. Caution: Rooting your device voids your warranty, so, doing it is on your own responsibility. 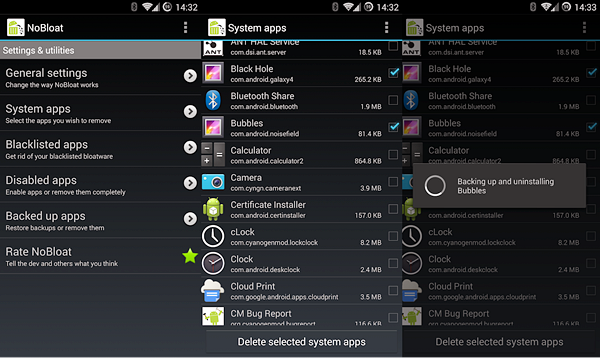 One of the most recommended apps to delete preinstalled Apps on Android, it’s a free application with many features including disabling, enabling, and deleting system apps, along with the ability to create a backup of them before the deletion process and restore them later on your demand. Also, you can get it for a few dollars to get more premium features like creating a blacklist of system apps to delete them in bulk, export your settings and export them later, easily finding the applications using search function, and changing backup folder location. The second choice for those who are willing to pay some dollars is Titanium Backup Pro Key, this one allows you to take a multiple backups per app, backup/restore SMS, call logs, Wi-Fi AP as XML, batch verification, sync from cloud storages, destroy all market links and more. You can also hide the application icon to avoid having anyone to do anything on your phone, and you will have the ability to clean Dalvic cache, move apps into ROM, and more. If you want to assure keeping your data safe from being lost or deleted for good, you should have a backup of all of it. 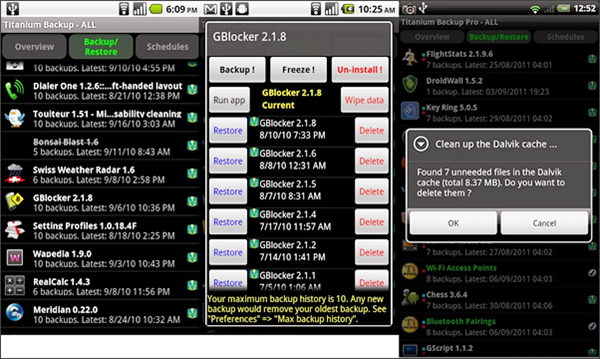 In order to do so, I recommend you using our Free backup software – Gihosoft Mobile Phone Transfer. Our software allows you to have a backup of all your data, including photos, videos, messages, call logs, WhatsApp messages and more, and it’s all for free with simple and easy steps. 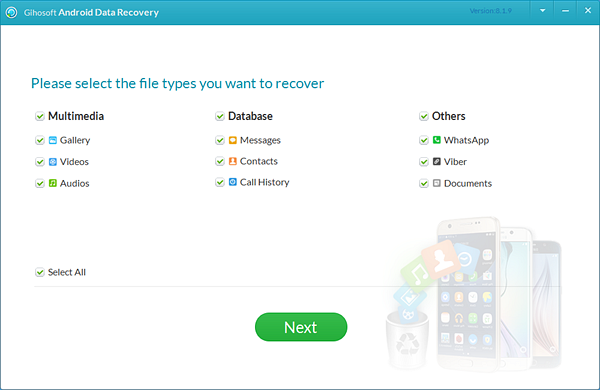 In addition, if you lost or deleted some important data by mistake, here’s a free Android data recovery software can help you quickly recover them even without backup. By reaching this line, you now know every possible way to delete Preinstalled Apps on Android with and without root. Always remember that every problem you will face, you will find a solution for it on Gihosoft, and don’t also forget sharing this article with your friends who are suffering from the low processing speed.